Hemodialysis requires the use of high volumes of freshly prepared, clean dialysate to foster the removal of low molecular weight metabolites (i.e., urea) and to correct the electrolyte and acid-base imbalance of chronic renal failure. Dialysate is produced by mixing clean, AAMI grade water with both an acid and base concentrate. This purpose of this report is to describe production, mixing and delivery of the buffer component of dialysate, and to also to address the cost, safety and feasibility of producing online bicarbonate. As endotoxin contaminated dialysate has been associated with the release of key mediators in acute and chronic inflammatory diseases associated with long-term hemodialysis therapy, aspects of disinfecting a bicarbonate delivery loop are also addressed. Chronic kidney diseases (CKD) adversely affects fetal and maternal outcomes during pregnancy. We retrospectively reviewed the renal, maternal and fetal outcomes of 51 pregnancies in women with CKD between July 2009 and January 2012. Of the 51 subjects (mean age 27.8 ± 7.04), 32 had 19 had estimated glomerular filtration rate (eGFR) <60 ml/min. There was significantly greater decline in eGFR at 6 weeks (55.8 ± 32.7 ml/min) after delivery as compared to values at conception (71.7 ± 27.6 [P < 0.001]). The average decline of GFR after 6 weeks of delivery was faster in patients with GFR < 60 ml/min/1.73 m 2 at −18.8 ml/min (stage 3, n = 13, −20.2 ml/min; stage 4, n = 6, −15.8 ml/min) as compared to −15.1 ml/min in patients with GFR ≥ 60 ml/min/1.73 m 2 . Three of the six patients (50%) in stage 4 CKD were started on dialysis as compared to none in earlier stages of CKD (P = 0.002). At the end of 1 year, all patients in stage 4 were dialysis dependent, while only 2/13 in stage 3 were dialysis dependent (Odds ratio 59.8, 95% confidence interval 2.8-302, P = 0.001). Preeclampsia (PE) was seen in 17.6%. Only 2/32 (6.25%) patients with GFR ≥ 60 ml/min/1.73 m 2 developed PE while 7/19 (36.84%) patients with GFR < 60 ml/min developed PE. Of the 51 pregnancies, 15 ended in stillbirth and 36 delivered live births. Eleven (21.56%) live-born infants were delivered preterm and 7 (13.72%) weighed < 2,500 g. The full-term normal delivery was significantly high (50%) in patients with GFR ≥ 60 ml/min/1.73 m 2 (P = 0.006) and stillbirth was significantly high - 9/19 (47.36%) patients with GFR < 60 ml/min/1.73 m 2 . To conclude, women with CKD stage 3 and 4 are at greater risk of decline in GFR, PE and adverse maternal and fetal outcomes as compared to women with earlier stages of CKD. Spectrum of causes for renal dysfunction in patients with hematolymphoid malignancy (excluding plasma cell dyscrasia) is varied. A retrospective evaluation of "native" renal biopsies referred to our institute during the period from January 2010 to December 2013 revealed 12 cases. Age ranged between 7 and 69 (median 54.5) years. All patients were males. The neoplasms included non-Hodgkin lymphoma, chronic lymphocytic leukemia, acute lymphoblastic leukemia, Burkitt's lymphoma, intravascular lymphoma, Hodgkin lymphoma and chronic myeloid leukemia. Proteinuria was noted in 66% of the patients (nephrotic range in 5, subnephrotic range in 3). Renal insufficiency was noted in 100% patients. Malignancy-related kidney injury was noted in 75% of the cases. 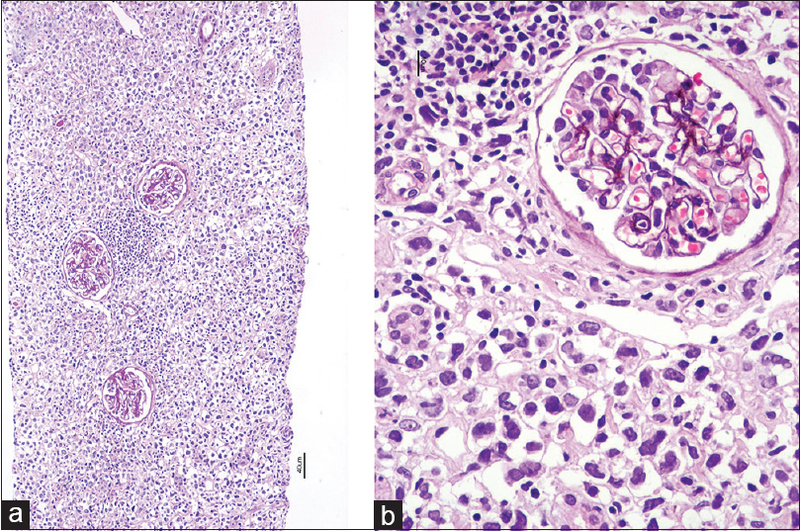 Renal histology showed lymphomatous infiltration (8), membranoproliferative glomerulonephritis (MPGN) (3), intracapillary monoclonal deposit disease (1) and intravascular lymphoma (1). Distribution of lymphomatous infiltration was diffuse in 50% and focal in 50%. We observed that renal dysfunction was predominantly a direct effect, that is, lymphomatous invasion. Paraneoplastic glomerulopathic changes occur in the form of MPGN. Proteinuria of >2 g/day correlated with glomerular disease. Vitamin E and C are well-known antioxidant vitamins. Oxidative stress is common in chronic kidney diseases. 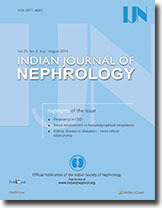 We evaluated 43 dialysis subjects prospectively in a cross-sectional survey. Serum vitamin E concentration was checked in all subjects; 37 cases underwent blood sampling for measurement of serum vitamin C. The enrolled subjects consisted of 12 (27.9%) peritoneal dialysis (PD) and 25 (58.1%) hemodialysis (HD) patients. Six (13.9%) patients were switched from PD to HD or vice versa. Serum concentration of vitamin E was normal, low and high in 9 (20.9%), 31 (72%) and 3 (7.1%) patients, respectively. There were no significant differences regarding age, gender, modality and duration of dialysis, and characteristics of dialysis sessions, mean serum blood urea nitrogen, and albumin levels between vitamin E deficient cases with those with normal serum vitamin E concentration (P > 0.05 for all). The serum vitamin C levels were low in 5 (13.5%) and normal in 32 (86.5%) patients. vitamin C deficiency was more prevalent in HD versus continuous ambulatory peritoneal dialysis patients (P = 0.128). Mean serum vitamin C concentration was higher in patients who were supplemented by vitamin C compared with those who didn't receive the vitamin supplement (P = 0.043). Vitamin E deficiency was a prevalent finding and supplementary vitamin C 30-60 mg/day was sufficient to prevent deficiency. Regular assessments of serum vitamin E level may be needed in dialysis centers. Ferric carboxymaltose (FCM) is a parenteral, dextran-free iron formulation designed to overcome the limitations of existing intravenous (IV) iron preparations. We investigated the safety and efficacy of high dose administration of FCM in our anemic chronic kidney disease (CKD) patients. It was a prospective observational study from June 2011 to August 2013. FCM was administered as IV infusion 1000 mg in 250 ml of normal saline over 15-30 min. Efficacy was evaluated by comparing the Hb and/or serum iron status at the first follow-up visit after the infusion with that at the baseline. A total of 500 infusions were administered to 450 patients. All patients had a successful administration of the FCM. None of the patients had any serious drug-related AE. AE of mild to moderate severity observed or reported after the infusion were: accelerated hypertension (0.2%), feeling abnormal (0.6%), headache and bodyaches (0.6% each), and infusion site reaction (0.8%). 261 patients had a follow up Hb, which showed an increase of 1.7 ± 1.5 g/dl after a period of 11 ± 7.2 weeks (P = 0.001); 188 (72%) patients had a rise in Hb of ≥1 g/dl. 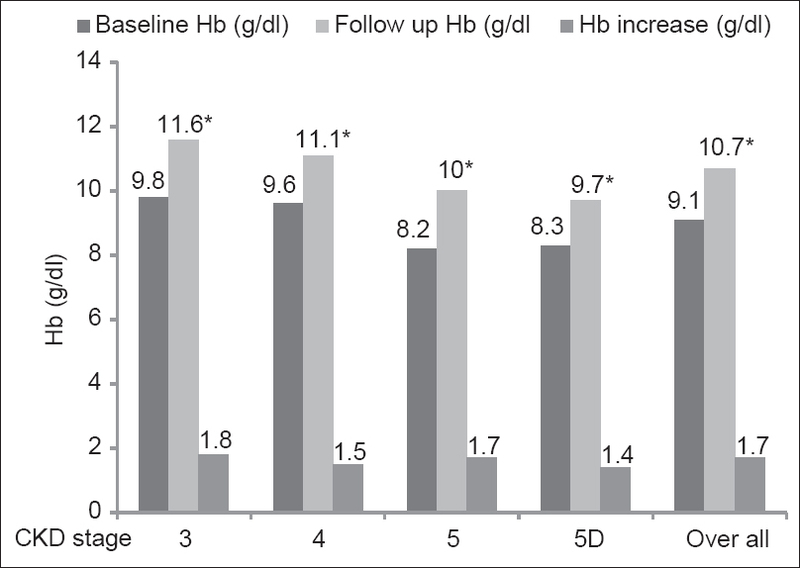 The increase in Hb was observed uniformly across all stages of CKD. Proportions of patients with an Hb of above 10 and 11 g/dl increased from 30.2% to 62.8% and 16.1% to 37.9%, respectively (P = 0.001). Iron status evaluation done in 44 patients after a follow up period of 15.1 ± 11.5 weeks showed increases in Hb of 1.6 ± 2.2 g/dl (P = 0.001), transferrin saturation of 9.1 ± 16.9% (P = 0.001), and ferritin of 406 ± 449 ng/ml (P = 0.001). We conclude high dose administration of FCM is safe and well-tolerated. It was effective in the treatment of iron deficiency in nondialysis and peritoneal dialysis CKD patients. Diabetic nephropathy (DN) has become the leading cause of end-stage renal disease worldwide. Non-diabetic renal disease (NDRD), is known to occur in diabetic patients. The renal and retinal relationship in type 2 diabetes mellitus (T2DM) with nephropathy is not uniform. 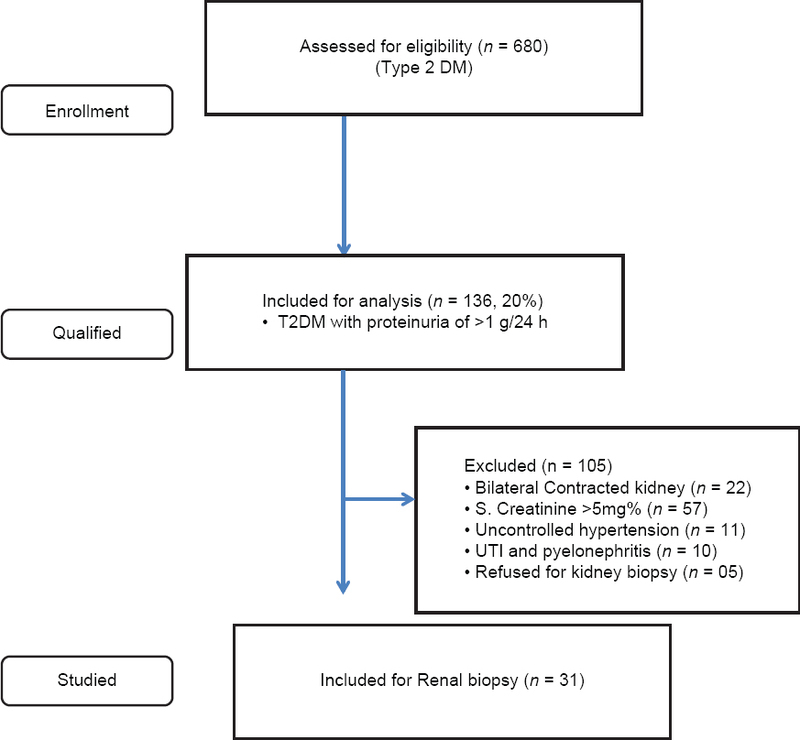 This study was carried to study the histological spectrum of nephropathy in type 2 diabetic patients with proteinuria and its relationship with diabetic retinopathy (DR). Total 31 (males - 26; females - 5) proteinuric type 2 diabetic patients were studied. Average age of patients was 50.7 years. Nephrotic syndrome was noted in 21 (67.7%) patients. Overall, isolated DN, NDRD and NDRD superimposed on DN (mixed lesion) were observed in 12 (38.7%), 13 (41.9%) and 6 (19.4%) cases, respectively. DR was absent in 21/31 (67.7%) cases. The spectrum of nephropathy in patients without DR included: DN in 6 (28.57%), NDRD in 12 (57.14%) and mixed lesion in 3 (14.29%). Kidney histology in patients with DR (n-10) revealed DN in 6 (60%), NDRD in 1 (10%) and mixed lesion in 3 (30%) patients. Thus, absence of DR favors NDRD but does not exclude DN because isolated DN was noted in 28.57% cases in absence of DR. Similarly biopsy proven NDRD (pure NDRD; 10% and mixed lesion; 30%) was noted in 40% of cases in presence of DR. In summary, patients with T2DM had higher incidence of NDRD. DR is less frequent (32.3%) in type 2 diabetes and is a poor predictor of type of nephropathy. Hence, renal biopsy is essential for precise diagnosis of nephropathy in patients with T2DM. Carpal tunnel syndrome (CTS) is the most common entrapment neuropathy seen in uremic patients. The study was undertaken to estimate the frequency of CTS in uremic patients and to identify the most sensitive electrodiagnostic test. Study was conducted on 80 subjects of age 30-60 years. End-stage kidney disease patients were recruited for the clinical evaluation, motor nerve conduction studies (NCS), sensory NCS, F wave study and median-versus-ulnar comparison studies (palm-to-wrist mixed comparison study, digit 4 sensory latencies study and lumbrical-interossei comparison study). Among three different diagnostic modalities, frequency of CTS was found to be 17.5% with clinical evaluation, 15% with routine NCS studies and 25% with median-versus-ulnar comparison studies. Among the median-versus-ulnar comparison studies, lumbrical-interossei comparison study was found to be most sensitive (90%). The comparative tests for CTS are more sensitive compared to routine NCS and clinical examination. 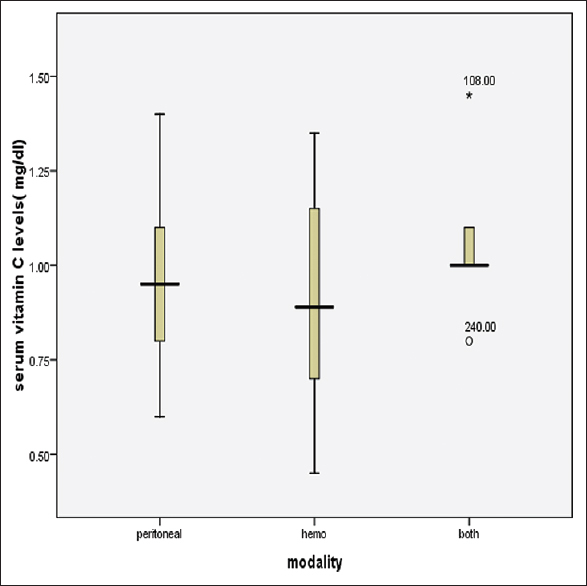 Among the comparative tests, lumbrical-interossei comparison study is the most sensitive. Early diagnosis of CTS may help patients of uremia to seek proper treatment at an appropriate time. We present a 58-year-old lady who underwent ultrasound-guided renal biopsy for suspected acute glomerulonephritis. Within minutes, the radiologist noticed an echogenic band around left kidney and in the muscular planes. Computerized tomography revealed focal active contrast extravasation from arcuate or interlobular artery in lower pole of left kidney and lumbar artery at third lumbar vertebra. The bleeding vessel was occluded with gelfoam. Multiple myeloma is an increasing cause of renal failure in the elderly. Early diagnosis of myeloma-associated acute renal failure is paramount and rapid initiation of disease-specific treatments with a combination of chemotherapy and dialytic therapies for instant removal of free light chains have been proposed. For immediate light chain removal, high cut-off dialyzers have been reported to yield superior light chain clearance parameters, but these dialyzers are not widely used due to increased treatment costs. In addition, the clinical virtue of hemodiafiltration (HDF) has not yet been definitively determined. We hereby present the case of a 70-year-old female patient with kappa light chain myeloma and acute on chronic renal failure. Daily HDF for 1-week using standard polysulfone high-flux dialyzers was implemented and led to remarkable and effective light chain reduction ratios between 87% and 95%. Vascular complications after percutaneous renal biopsy are uncommon and may require interventional management. In most of these cases, the pathology is a renal arterial pseudoaneurysm (PsA) or an arterio-venous fistula. Injury to other vessels like aorta, lumbar arteries or mesenteric arteries is rare with only one case of left colic artery PsA reported in literature. 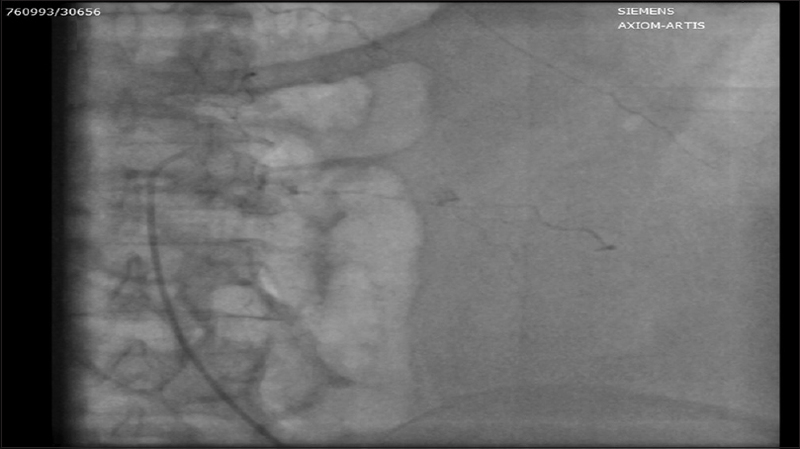 We report a case of a 60-year-old female, who developed left colic artery PsA after renal biopsy, which was successfully embolized through endovascular route using microcoils. We report a case of a young female patient who presented with weakness of upper and lower limbs. On evaluation, she had hypokalemia, hypomagnesemia, metabolic alkalosis and hypocalciuria. Anti-Ro (SSA) antibody was positive. She had an acquired Gitelman syndrome due to primary Sjögren's syndrome (SS). SS presenting with features of Gitelman syndrome is very rare. Immunoglobulin A (Ig A) nephropathy is the most common form of primary glomerulonephritis. The association of Ig A nephropathy with Grave's disease has not been reported so far. We report a case of 20-year-old female with Grave's disease who presented with edema, facial puffiness, and decreased urine output. She was found to be hypertensive with renal failure and nephrotic range proteinuria. 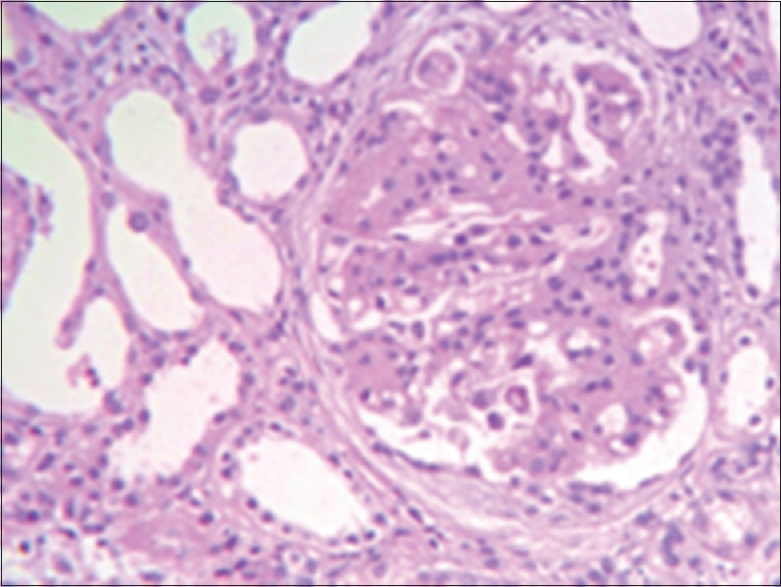 Renal biopsy revealed features of Ig A nephropathy. The patient was treated with oral corticosteroids (1 mg/kg/day). To our knowledge, this is the first case showing association of Grave's disease with Ig A nephropathy. Spontaneous retroperitoneal hemorrhage (SRH) is a rare and potentially fatal condition. Acquired cystic kidney disease (ACKD) may cause SRH in hemodialysis patients. However, presentation of retroperitoneal hematoma as hemoperitoneum in peritoneal dialysis (PD) patients is exceedingly rare. 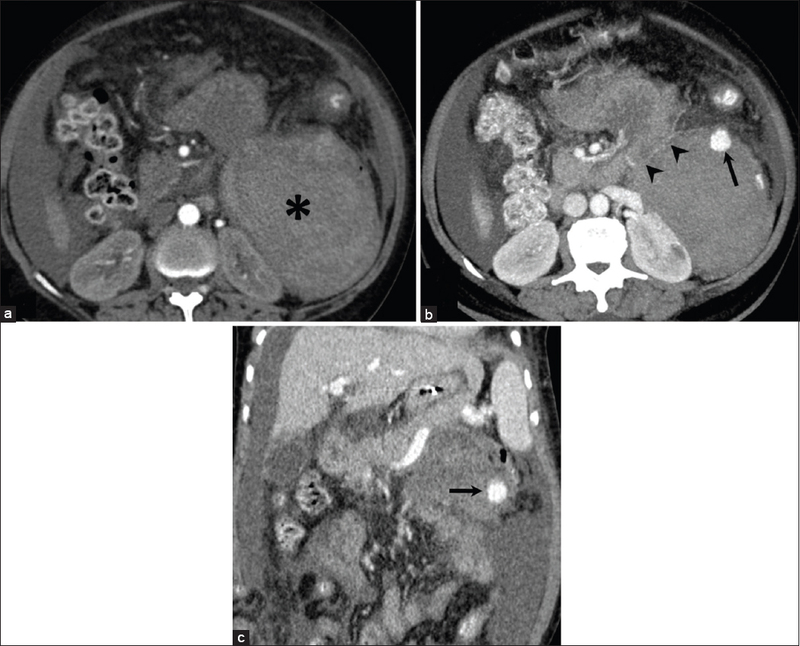 We report a 44-year-old male PD patient who presented with hemoperitoneum secondary to retroperitoneal hematoma. The reason of SRH was rupture of the cysts of ACKD. 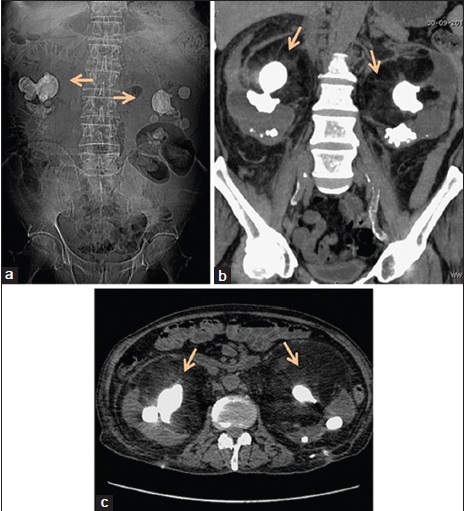 The patient underwent unilateral nephrectomy with subsequent disappearance of hemoperitoneum. The importance of this case lies in the fact that the patients who have been receiving dialysis for a long time should be under surveillance in terms of ACKD development and potential associated complications such as cyst hemorrhage and malignancy.